In January 2006, we held our first forecasting seminar, based on the tools and techniques described in the Handbook of Market Esoterica. We covered all the material in the handbook itself, and included plenty of bonus material and experimental techniques. 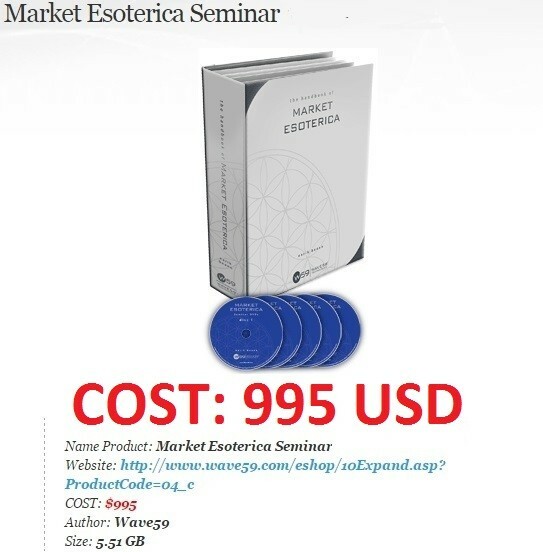 The seminar package includes 4 DVDs, a 600+ page workbook, and a software disc containing scripts, helper tools, and an exclusive astronumerology calculator. I know it sounds incredible. Being able to forecast whether the stock market will be up or down in the future is every trader’s fondest dream. Conventional wisdom tells us that there is no way to do this – that the market is random and being able to predict what the market will do tomorrow is impossible. Yet there are records of traders who have done just this. Traders like WD Gann, George Bayer, and Marechal all were able to project what the market would do in the future. Not only once, but over and over, repeatedly and consistently calling tops and bottoms ahead of time. In fact, back in 1933, George Marechal made public a forecast for the Dow Jones Industrial Average for the next 15 years which was nearly perfect. The reason that these traders were able to accomplish these feats is that they were looking at the markets in a totally different way than we do today. While modern traders focus on moving averages, relative strength, and oscillators when looking at the markets, the legendary traders focused on geometry, vibration, and natural law. These legendary traders realized that markets were expressions of nature, and followed the same laws that govern the natural world. Once these laws were studied and understood, then the doors to forecasting were thrown open. Market Esoterica is the culmination of research along these lines. It is a trading course that will show you the true nature of price and time, how to measure the energy that moves the markets, and how to use the markets own geometric structure to forecast price movements in the distant future.